Micronesia, from the ancient Greek μικρος (small) and νησος (island), is the name of one of the three ethnogeographic areas (with Melanesia and Polynesia) of Oceania, a region in the Pacific Ocean. The Philippines lie to the west, Indonesia to the south west, Papua New Guinea and Melanesia to the south, and Polynesia to the south-east and east. Micronesia is one of three major cultural areas in the Pacific Ocean. This article is about the greater region. For the independent state, see Federated States of Micronesia. Located for the most part, north of the equator, it comprises more than 2000 islands with a total land area of about 2730 square kilometers (1055 square miles). The Federated States of Micronesia consists of 607 islands extending 1800 miles (2900km) across the archipelago of the Caroline Islands east of the Philippines. The four constituent island groups are Yap, Chuuk (called Truk until January 1990), Pohnpei, and Kosrae. The Marshall Islands consists of 29 atolls and five isolated islands. The most important atolls and islands form two groups: the Ratak Chain and the Ralik Chain (meaning "sunrise" and "sunset" chains). Palau's most important islands are Angaur, Babeldaob, Koror, and Peleliu. The latter three lie together within the same barrier reef; Angaur is an oceanic island several miles to the South. The Northern Mariana Islands—together with Guam to the south—comprise the Mariana Islands. The southern islands are limestone with level terraces and fringing coral reefs; the northern islands are volcanic, with active volcanoes on Anatahan, Pagan Island, and Agrihan. Nauru is a small, oval-shaped island, 26 miles (42km) south of the equator. The island is surrounded by a coral reef that has prevented the establishment of a seaport. Kiribati, formerly the Gilbert Islands, comprises 32 atolls and one island (Banaba), scattered over 1,351,000 square miles (3,500,000 km²) near the equator. Guam (Chamorro language: "Guåhån"), an organized unincorporated territory of the United States, has an area of 210 square miles (544 square kilometers). The northern part of the island is a forested coralline limestone plateau while the south contains volcanic peaks covered in forest and grassland. A coral reef surrounds most of the island. Wake Island is a coral atoll located about two-thirds of the way from Hawaii to Guam. It is an unorganized, unincorporated territory of the United States. Access to the island is restricted, and all activities on the island are managed by the United States military. Western Micronesia, comprising Palau and the Mariana Islands, was first settled about 3500 years ago, probably by people from Indonesia or the Philippines. Eastern Micronesia was settled at about the same time, possibly by people from eastern Melanesia. A decentralized chieftain-based system eventually evolved into a more centralized economic and religious empire centered on Yap. Nan Madol, consisting of a series of small artificial islands linked by a network of canals, is often called the Venice of the Pacific. It is located near the island of Pohnpei and used to be the ceremonial and political seat of the Saudeleur dynasty that united Pohnpei's estimated 25,000 people from about 500 C.E. until 1500 C.E., when the centralized system collapsed. The term "Micronesia" was first proposed to distinguish the region in 1831 by Jules Dumont d'Urville. Before this, the term "Polynesia" was in use to generally describe the islands of the Pacific. After the First World War, Germany's Pacific island territories were taken from it and were made into League of Nations Mandates. Nauru became an Australian mandate, while Germany's other territories were given as mandates to Japan. This remained the situation until Japan's defeat in the Second World War, when its mandates became a United Nations Trusteeship governed by the United States, the Trust Territory of the Pacific Islands. Between 1946 and 1958, the US tested 67 nuclear weapons in the Marshall Islands, including the largest nuclear test the US ever conducted, Castle Bravo, which resulted in the radiation poisoning of 236 Marshallese. Nuclear claims between the United States and the Marshall Islands are ongoing, and health effects still linger from these tests. In 1990, a Japanese soldier who had been in hiding on Guam since WWII ended 45 years earlier, was designated the last soldier on active military duty left in the islands. His family thought that he had been killed in action. All of Micronesia (with the exception of Guam and Wake Island, which are US territories, and the Northern Mariana Islands, which are a U.S. Commonwealth) are now independent states. The politics of Micronesia, with the exception of Nauru and Guam, takes place in a framework of a presidential, representative democratic pluriform multi-party system. Nauru is a republic with a parliamentary system of government. The president is both the head of state and head of government. Guam is governed by a popularly elected governor and a unicameral 15 member legislature. Guam elects one non-voting delegate to the US House of Representatives. United States Government assistance is the mainstay of the economy of the Federated States of Micronesia, the Marshall Islands, Palau, and the Northern Mariana Islands. Agricultural production is concentrated on small farms, and the most important commercial crops are coconuts, tomatoes, melons, and breadfruit. Small-scale industry is limited to handicrafts, fish processing, and copra, a coconut product. The economy of Palau consists primarily of tourism, subsistence agriculture, and fishing. Tourist activity focuses on scuba diving and snorkeling in the islands' rich marine environment, including the Floating Garden Islands to the west of Koror and the Rock Islands to the south. The government is the major employer of the work force, relying heavily on financial assistance from the US. Nauru's economy depends almost entirely on decreasing phosphate deposits; there are few other resources, and most necessities are imported. Kiribati has few natural resources. Commercially viable phosphate deposits were exhausted by the time of independence. Copra and fish now represent the bulk of production and exports. Tourism provides more than one-fifth of gross domestic product. Foreign financial aid, largely from the United Kingdom and Japan, is a critical supplement. Guam's economy depends on tourism, the United States military base presence, and other federal spending. Although Guam receives no foreign aid, it does receive large transfer payments from the general revenues of the U.S. Federal Treasury to which Guam contributes no income or excise taxes. Blood type analysis has shown that Micronesians are distinct from Australian, Asiatic, and Polynesian races. The Marshallese are of Micronesian origin and emigrated from Asia several thousand years ago. Although English is an official language and is spoken widely, although not fluently, Marshallese is used by the government. The Japanese language is also occasionally spoken in some areas of Marshall Islands. Early Palauans may have come from Australia, Polynesia and Asia. Palauans may represent many parts of Melanesia, Micronesia and Polynesia, but are traditionally considered to be Melanesian. 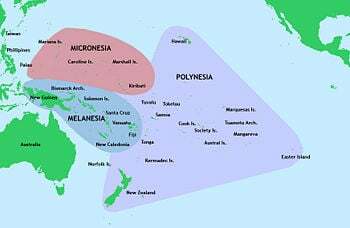 According to geneticists, there are two distinctive strains of Melanesian bloodlines: one is associated with indigenous Australians/Papua New Guineans and the other is known to have originated in Asia. There has not been any link established between the two. The population of Palau is approximately 19,000, 70 percent of whom are native Palauans, who are of mixed Melanesian, Micronesian, and Polynesian descent. Filipinos form the second largest ethnic group. Other Asians and Europeans account for the minority groups. Of Nauru's 13,048 residents, 58 percent are Nauruan, 26 percent are other Pacific Islanders, eight percent are Chinese and eight percent are Europeans. Kiribati was inhabited by a single Micronesian ethnic group that spoke the same Oceanic language for 2000 years before coming into contact with Europeans. While English is the language of the Constitution and the law, the native Micronesian language, "Te taetae ni kiribati," is still widely spoken. Guam’s inhabitants are the Chamorros, who first populated the island approximately 4000 years ago. Micronesia is mostly Christian. Most Marshallese are Protestant. Palauans are largely Catholics and Seventh-day Adventists, while Modekngei is the indigenous religion. Two-thirds of Nauruans are Protestant, and one-third are Roman Catholic. The native languages of the various Micronesian indigenous peoples are classified under the Austronesian language family. Almost all of these languages belong to the Oceanic languages subgroup of this family. However, three exceptions are noted in Western Micronesia, which all belong to the Western Malayo-Polynesian subgroup: the Chamorro language in the Mariana Islands, Yapese in the Federated States of Micronesia, and Palauan in Palau. This latter subgroup also includes quite a few languages spoken today in the Philippines, Malaysia, and Indonesia. On the eastern edge of the Federated States of Micronesia, the languages Nukuoro and Kapingamarangi represent an extreme westward extension of Polynesian languages. The most common locally produced foods in Palau are cassava, taro, giant taro, yams, potatoes, fish, and pork. Popular imports include rice, chicken, canned tuna, and canned meats. Despite its size, Palau has a rich and continuous artistic tradition. With the exception of body art, nearly all arts heritage is either directly associated with the architecture of the "bai," or ceremonial men’s meeting-house. Palauan women, however, have always been endowed with land, titles, and money. For thousands of years, Palauans have had a well-established matriarchal society. The clan system is the basis for social organization in Palau. On Nauru, colonial and contemporary culture has displaced indigenous culture. Few of the old customs have been preserved, although some forms of traditional music, arts, and crafts, and some traditional methods of fishing are still practiced. Micronesian music is based around mythology and ancient Micronesian rituals. It covers a range of styles from traditional songs, handed down through generations, to contemporary music. Traditional beliefs suggest that music can be presented to people in dreams and trances, rather than being written by composers themselves. Micronesian folk music, like Polynesian music, is primarily vocal-based. Kiribati folk music is based around chanting or other forms of vocalizing, accompanied by body percussion. The uniqueness of Kiribati's dance traditions when compared with other forms of Pacific Island dance is its emphasis on the outstretched arms of the dancer and the sudden birdlike movement of the head. This page was last modified on 24 September 2016, at 18:28.